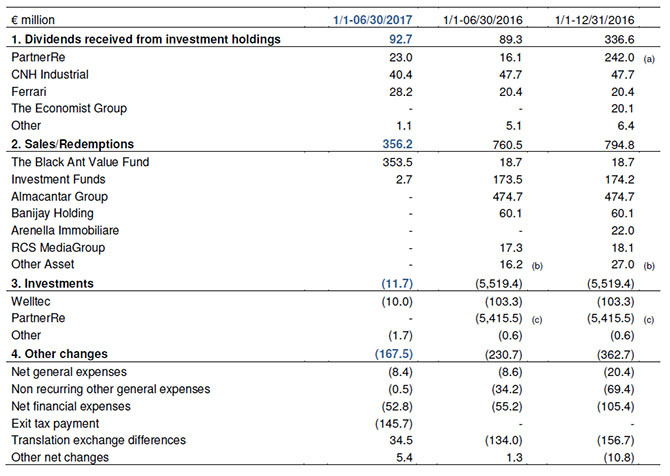 The net financial position of the Holdings System at June 30, 2017 is a negative €3,228.6 million and shows a positive change of €195.7 million compared to the balance at year-end 2016 (negative €3,424.3 million). if held to maturity as an investment for a part of the Group’s available cash such that it can receive a constant attractive flow of financial income they are measured at amortized cost. Such designation was made in accordance with IAS 39, paragraph 9. These financial instruments are free of whatsoever restriction and, therefore, can be monetized whenever the Group should so decide. There are no trading restrictions and their degree of liquidity or the degree to which they can be converted into cash is considered high. Cash and cash equivalents include demand deposits or short-term deposits, and readily negotiable money market instruments and bonds. Investments are spread over an appropriate number of counterparties chosen according to their creditworthiness and their reliability since the primary objective is to hold investments which can readily be converted into cash. (a) Originally €250 million; the amount was increased by another €200 million in May 10, 2016. The issue price corresponds to the weighted average of the prices calculated on the entire amount of €450 million. Financial receivables from related parties of €11.4 million refer to the receivable from Almacantar Group S.A.
Financial payables of €735.2 million include the financing drawn down on the remaining credit line secured under the May 11, 2015 Financing Agreement between by EXOR, EXOR Nederland, Citigroup Global Markets Limited and Morgan Stanley Bank for the acquisition of PartnerRe, for a total of $500 million (€ 438.1 million). There are also included short-term loans secured by EXOR from leading credit institutions for €296.1 million. Other financial liabilities (€27.7 million) consist of the measurement of cash flow hedge derivative instruments. (a) Of which €16.1 million received on 4,725,726 PartnerRe shares held before the acquisition of control on March 18, 2016. (b) At June 30, 2016:sale of Rothschild shares for €9.3 million and other non-current assets for €6.9 million. At December 31, 2016: sale of Rothschild shares for €20.1 million and other non-current assets for €6.9 million. (c) Of which $6,065 million (€5,377.7 million) paid to common shareholders and $43 million (€37.7 million) to preferred shareholders of PartnerRe. At June 30, 2017 EXOR has irrevocable credit lines in Euro of €390 million, of which €350 million is due after June 30, 2018, as well as revocable credit lines of €636.8 million. At the same date EXOR also has credit lines in foreign currency for a total of $590 million (€517 million) due after June 30, 2018. On April 28, 2017 Standard & Poor’s affirmed the rating for EXOR’s long-term and short-term debt at “BBB+” and “A-2”, and has improved the outlook to “stable” from “negative”.